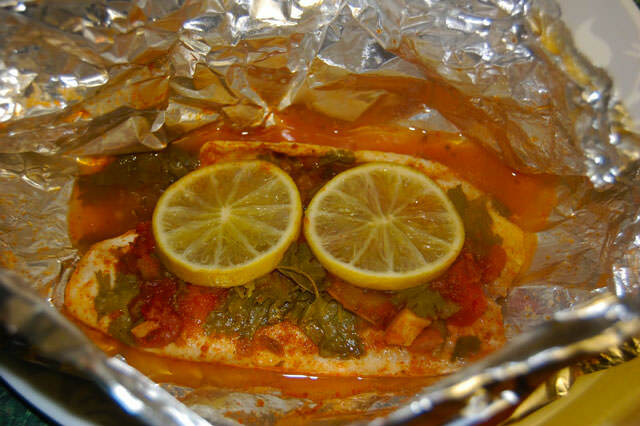 This tilapia dish is going to become one of your favorite seafood dishes and that is a guarantee. It is super easy to make, it is delicious, comes with a bit of a twist and it is very, very healthy. Tilapias were never this sassy before. Feel free to use fresh tomatoes and chile peppers. Make 4 aluminum foil squares and coat one side of each with olive oil. Put a single fillet on each square. Put generous amounts of tomatoes over the fish and sprinkle with cilantro and lime juice. Put two slices of lime on each fillet. Carefully fold the foil into packets and seal them tightly. Place on a baking tray. Bake for about 20 minutes or until fish can be flaked with nothing but a fork.